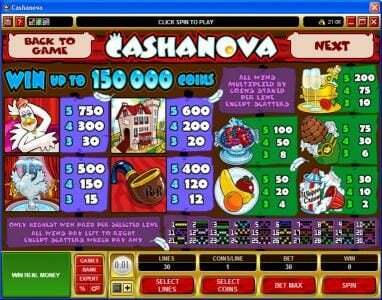 Cashanova online slot machine pictures and slot feature list from Microgaming, play Cashanova Slots for free. Cashanova Slots 5 out of 5 based on 2 ratings. 2 user reviews. 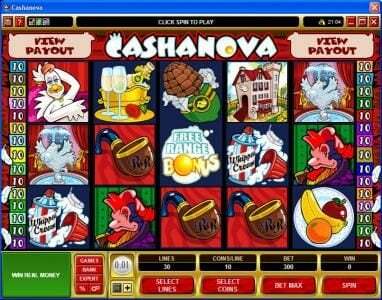 Cashanova is a 5 reel, 30 payline video slot that is brought to you by Microgaming. This slot is ready to fill your pockets with cash, just as the name suggests, and does so with wild symbols, scatters, multipliers, Free Spins and two Bonus games. It even offers up a maximum prize of $37,500! The theme of Cashanova is loosely based on wealthy chickens and the lifestyle they enjoy. 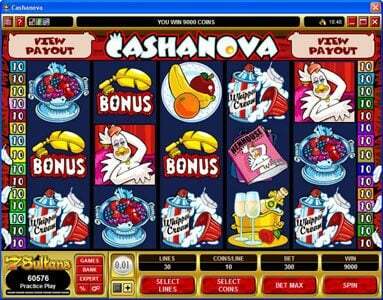 The graphics in Cashanova have been created with to include some colorful interpretations of chickens and hens. All of the symbols will give you a smile as you find them sitting on the reels. It is nice to return to a video slot that offers humorous symbols that not only can offer up some great wins but also give you a laugh as you imagine how life would be if such things were to be true. Those very symbols include a can of whipped cream, a husk of corn, a luxurious pipe, a water fountain with chicken statue, champagne and glasses, plate of fruit, bowl of fruit, a MANSION and Henrietta the empress of all chickens! The bonus symbol is the feather, the scatter is the Hen-House Magazine and the Free Range Bonus game is the Free Range Bonus symbol. The minimum coin size for this game is $0.01 and the maximum is $0.25. This will allow for a betting range of $.030 up to $75. For those who like to wager smaller amounts it gives them some great opportunities to build their chip stack and those who like to roll high will be impressed with the opportunities that lay ahead with this video slot. 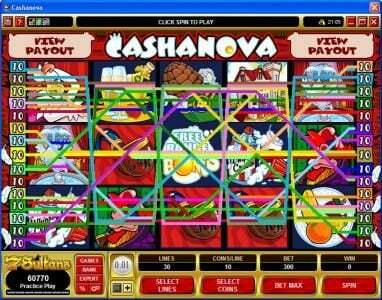 Cashanova offers up some Slot features to help you on your way. The first is the wild symbol, which is represented by Roger the Rooster. It will match all other symbols with the exception of the scatter and bonus symbols. The scatter is another and can award up to 100 times your bet when you land 5. It will even give you 2 times your wager should two appear on the reels. The barn bonus is triggered when three of the feather bonus symbols land on the first 3 reels. This takes you off to the barn where you will select objects to win a cash prize. The barn bonus is only available to be triggered in the base game and not during the free spins. If you find a key during the barn bonus you will then get to play the “Get Lucky Bonus” You will present ole Henrietta with a gift and win a cash prize based on how impressed she was. The free range bonus is the reel excitement in Cashanova. It gets triggered should you find three or more of the Free Range Bonus symbols on reels, 3 through 5. This can reward you with up to 15 free spins with a 5 times multiplier. The free spins cannot be re-triggered. Cashanova is a great game that is truly fun to play. It is one of the older video slots from Microgaming but still holds much value on multiple levels. I have played a lot of different casinos and games, but this one has the cutest bonus round of all. 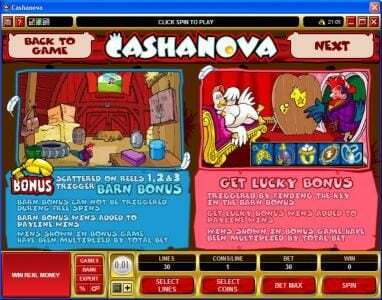 Cashanova is a fun and cute game to play. The "getting lucky bonus" is cute. Cashanova actually has 2 different bonuses to get. This is an enjoyable game to play.